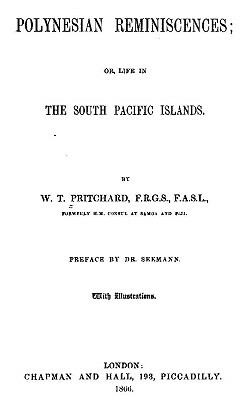 W. T. Pritchard : Surf riding in Somoa, 1866.
or, Life in the South Pacific islands. Chapman and Hall, London, 1866. But to return to the Samoans. So great is their love of the water, that whenever the surf rolls in over the reefs rather more heavily than usual, boys and girls, from five to twenty years of age, are sure to be there, some with boards, others without, sliding along indiscriminately on the curling breakers, and thinking it the best fun in the world. jump as the breaker takes them, and away they "scud" in the midst of the white sea-foam, shouting and yelling with their loudest voices (which by the way is not the least part of the fun), and jeering each other as the swifter ones pass the slower. and quietly sinking down as the larger and stronger ones pass over, or boldly diving through them. The starting-place reached, away they all go again just as before, and keep at the game until the tide ebbs and leaves the reef bare. When tired of swimming, they take to their paopao, or little canoes, and pass the rest of the morning in them at the same sport, swamping. The mysterious cold hand was that of another old woman, who was in the secret, and an agent also of the Great Spirit. else requisite for life to come down from the skies for his faithful followers, while the unbelievers would be eternally destroyed. Great preparations were made for the expected visit of Sisu Alaisa. He [the captain] stood on the poop by the mainmast, and shouted that he would shoot the first man that left the vessel before the women were rescued ; but there was no gun or revolver in his hand or his belt, and men who had been in California thought lightly of the threat. at home in the water, jumped over, and at him the captain threw a marlinspike with a good aim for his head, but which he dodged by simply sinking himself, and away he went on the surf and under it until he reached the smooth water inside the reef. Geoff Cater (2013) : W. T. Pritchard : Surf Riding in Somoa, 1866.